This is a painting I did for my class of one of my bad dreams. 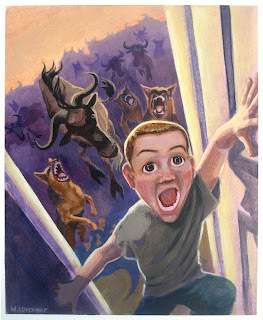 When I was a kid I would sometimes have these dreams that I was alone in my neighborhood, then all these wildabeest's and German Shepards would come frome every where and start chasing me until I barricaded my self in my house. For anyone who believe that dreams need to mean something, feel free to analyze this one.